GoodWorkLabs is the best full-service 2D game art outsourcing company in India, serving the leading game publishers and game developers worldwide. Based in the heart of India’s Silicon Valley Bangalore, India, GoodWorkLabs Game Studio with a large team of game designers, artists and developers has become the top 2D game art outsourcing company in India. We provide turnkey solutions and time-and-material (T&M) engagement for clients to produce the best 2D game art. Why GoodWorkLabs stands out as the leading 2D Game Art Outsourcing Company? GoodWorkLabs has the right expertise and experience in creating the most awesome and most trendy graphics, characters, concept art, backgrounds in 2D games. Our expert 2D game art outsourcing team understands the changing need of the gaming industry across the world. Most of our clients are from Europe and North America and hence we understand what visuals and graphics the global audience prefers and finds engaging. 2D game art outsourcing on different platforms needs different skills and tricks to deliver the best experience. GoodWorkLabs Game Studio has worked on tens of projects on the console game 2D art and development, mobile app 2D game art design, Xbox and Sony Playstation game art 2d Design, web and HTML5 game 2D art outsourcing and development and so on. Our team is focused on delivering the high quality 2D game art on-time, every-time. At GoodWorkLabs, we use Agile game development methodologies (SCRUM) for game development. We rapidly go from concept art, storyboarding, character sketches to creating the final high-quality 2D characters, 3D characters, backgrounds, animation, and the entire ecosystem required to produce a great game. The client team visits our offshore location for workshops in the beginning. We will then create start the pre-production phase in close coordination with the game publisher or client. In production phase, the 2D artists add colour, finish, detailing to the characters and the backgrounds. Once it goes through the review and rework required to create the pixel perfect finish required. With great attention-to-detail, our creative directors guide both our 2D artists and the client to arrive at a graphic universe that is unique and wonderful keeping in mind the target audience. Watch this video to understand our step-by-step process of how we visualize the design right from concept to reality. Ask for proposals and quotes from your 2D Game Art Outsourcing Company. Sign the Non-disclosure agreements and IP clauses. The IP of the game should be yours. Know the point of contact in the company, how well they understand game development and art in the 2D Game Art Outsourcing Company. GoodWorkLabs satisfies all these criteria of being the best 2D game art outsourcing company in India, Bangalore. 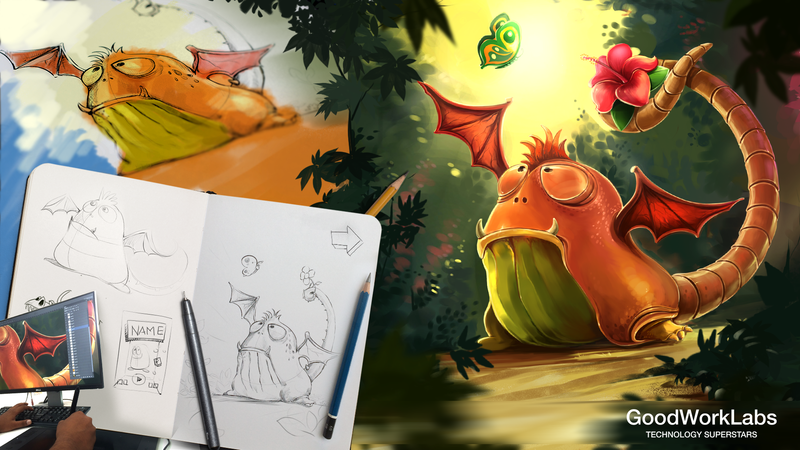 GoodWorkLabs Game Studio employs the best talent in the 2D game art outsourcing industry globally. Our 2D artists have experience in Virtual Reality games, Augmented games, mobile games development (Android game development, iPhone game development, Windows game development). We have expertise in different industry verticals including education, casual games, casino games, arcade games, sports games, entertainment games, etc. Hire our team to create your world-changing game! Are you looking for someone who can transform your idea into world-class 2D Game Art? Contact us today and receive a FREE QUOTE.